I hope you are having a lovely day so far. 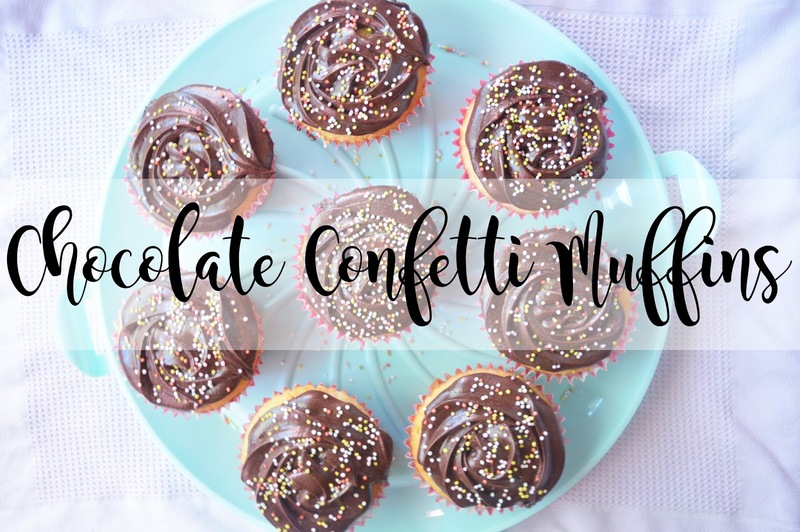 Today I am going to be sharing with you another gorgeous recipe of chocolate and vanilla confetti muffins. I love cake and I absolutely love chocolate so these were a real winner! I thought they looked quite sweet with hundreds and thousands on top too; they're the perfect party treat. If you want to know how to make them then carry on reading and I will tell you how! Preheat the oven to 180 degrees Celsius & Line a muffin tray with paper case. Add in the eggs and mix until combined, then add the vanilla extract. In a separate bowl sift plain flour and baking powder together. Slowly add half of the flour, mix and then add half of the milk; do this repeatedly until mixture is smooth. Use an ice cream scoop and scoop the mixture into the paper cases until 2/3 full. Bake for 22 minutes. Cool in the tin for a few minutes and then transfer to a wire rack to cool completely. Once the muffins have cooled completely you can make the icing! Melt the butter, stir in cocoa. Alternately add icing sugar and milk, beating till it's a smooth consistency. Don't forget to add the vanilla during this step! Use a piping bag and the Wilton 2D icing tip to create your rose shaped frosting. If you make these, make sure to show me via Twitter or Instagram! Love this post! You need to share your photography tips with us all at some point!